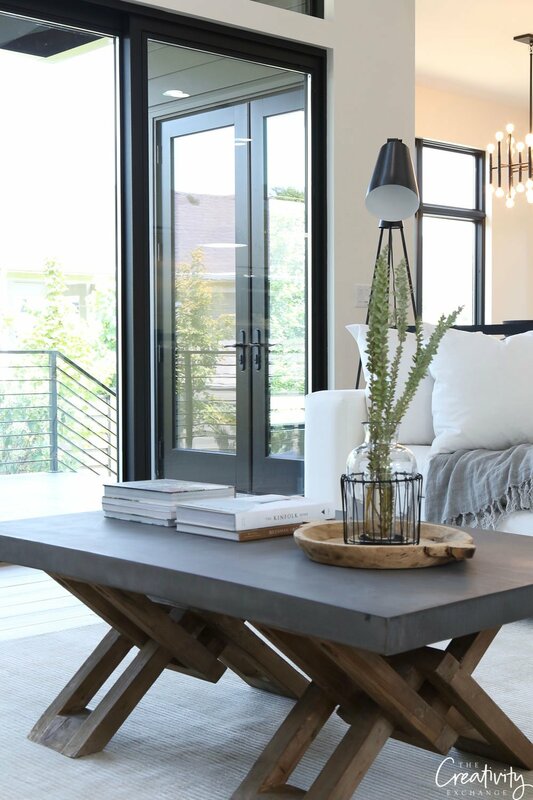 Builder home tours and custom-built dream homes can be a great way to discover home design and interiors trends. 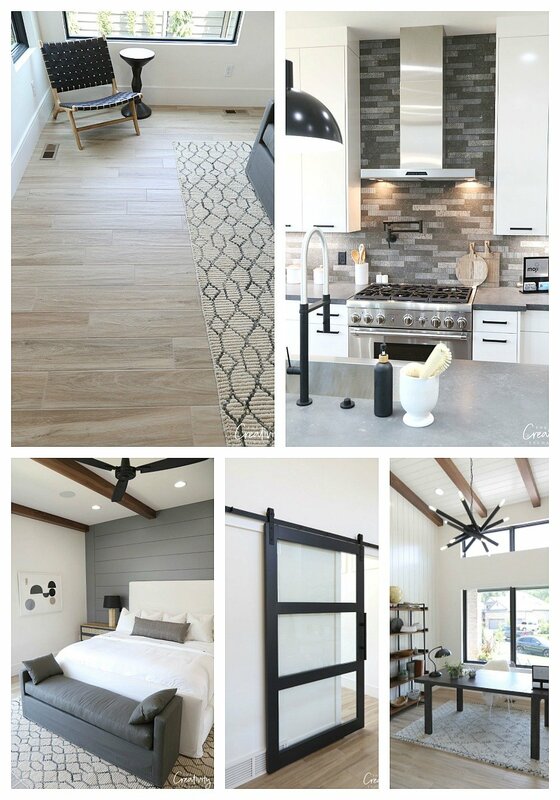 With that in mind, we decided to share a contemporary modern farmhouse and video home tour, a bit different than the usual modern farmhouse style like Millhaven Homes, but we’re sure you will be inspired. 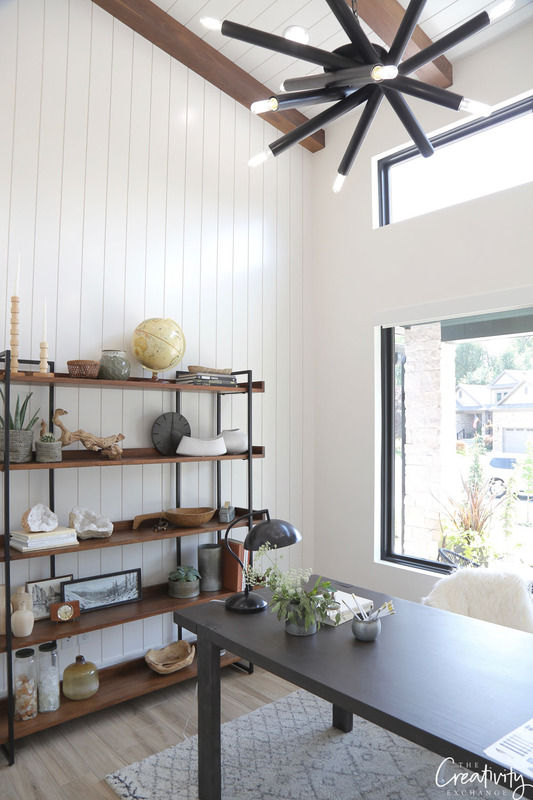 Built by Steven Dailey Construction, this custom built home on a lot in an established neighborhood, “The Andreas” takes full advantage of the space. The budget was a cool $1 million for this 4,000 sq ft home. 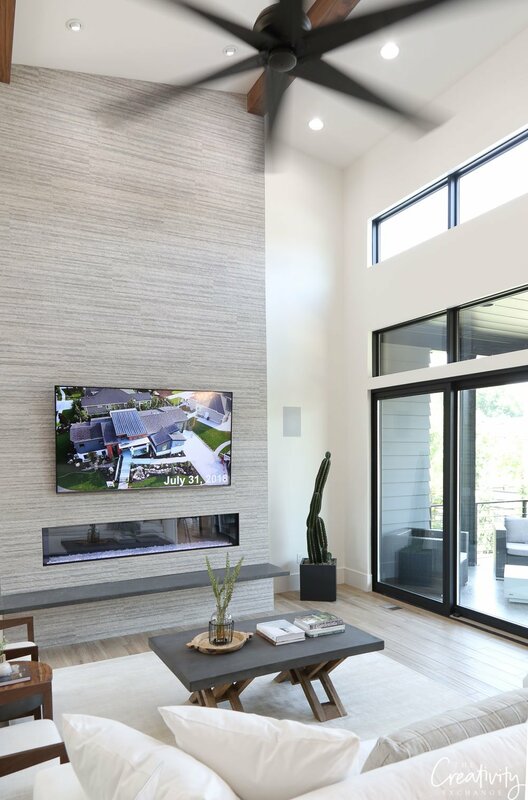 The main floor has porcelain flooring throughout, with floor to ceiling windows creating a light and airy space that features a large kitchen open to the living and dining areas. 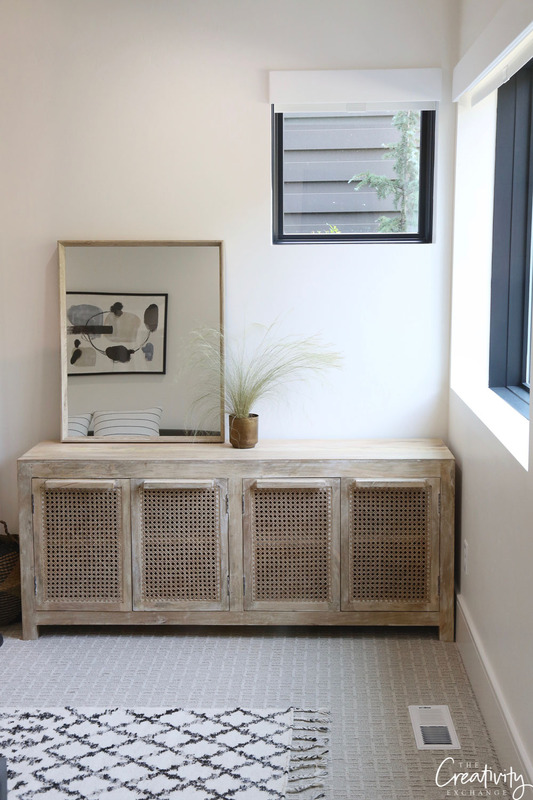 The interior design is by Ames-Interiors. We liked the house so much we went back to do a video tour. They did not go matchy-matchy. 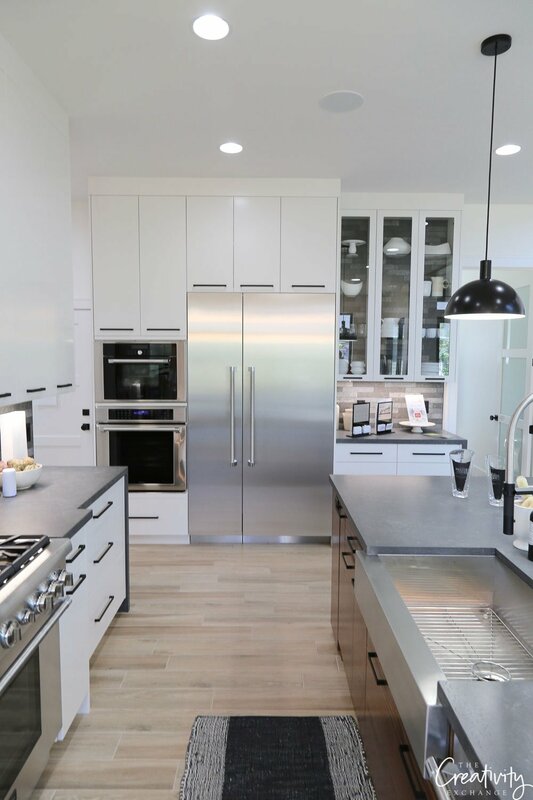 The island cabinetry, with a built in wine rack at one end, has a wood finish while the rest of the kitchen is white. 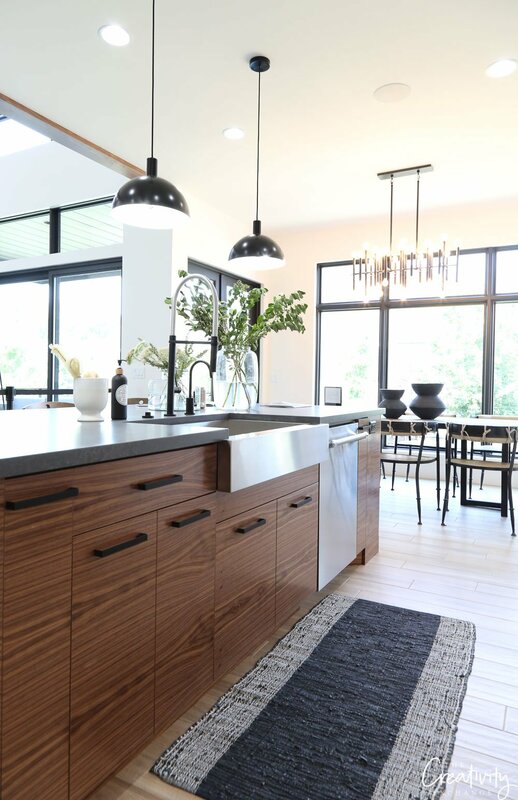 The unifying element is the black hardware and black pendant lights. 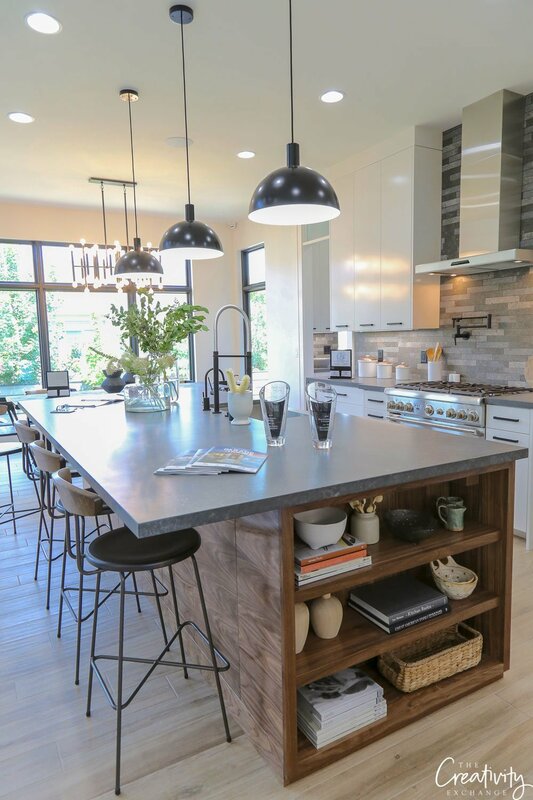 The countertop is quartz , a gorgeous and highly durable choice as it is stain and scratch resistant, and there is no need to seal it, unlike granite and marble. Quartz has so many varied options, not with just pattern and color but also surface texture from highly polished to rough. 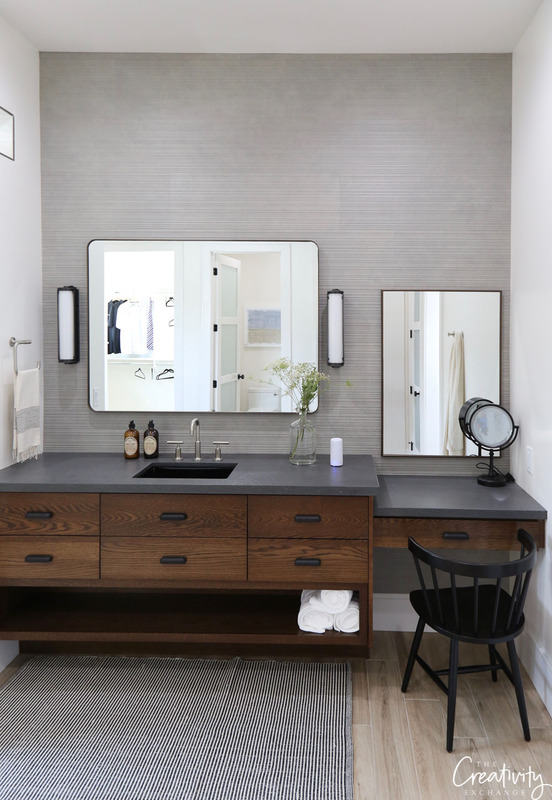 Caesarstone is one of the more famous commercial names for quartz counter tops. The only downside, most quartz countertops can only take up to 400 degree heat. 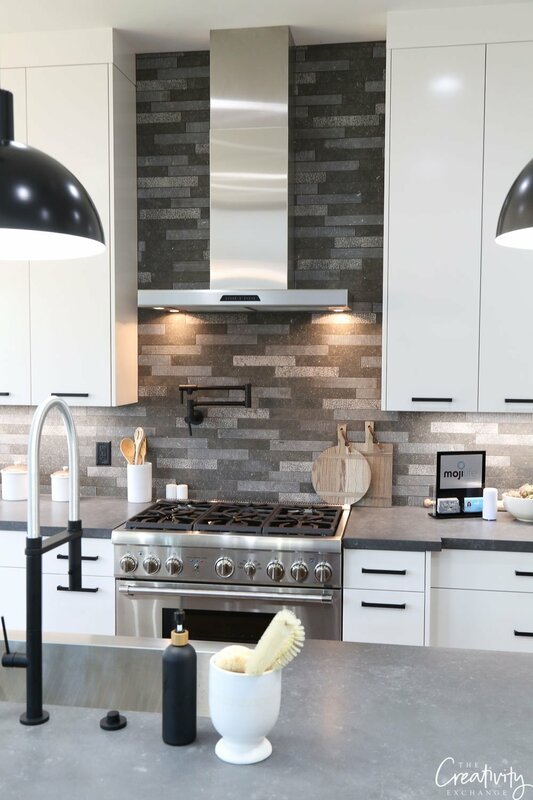 The backsplash pulls together the grey countertop with the white cabinetry. 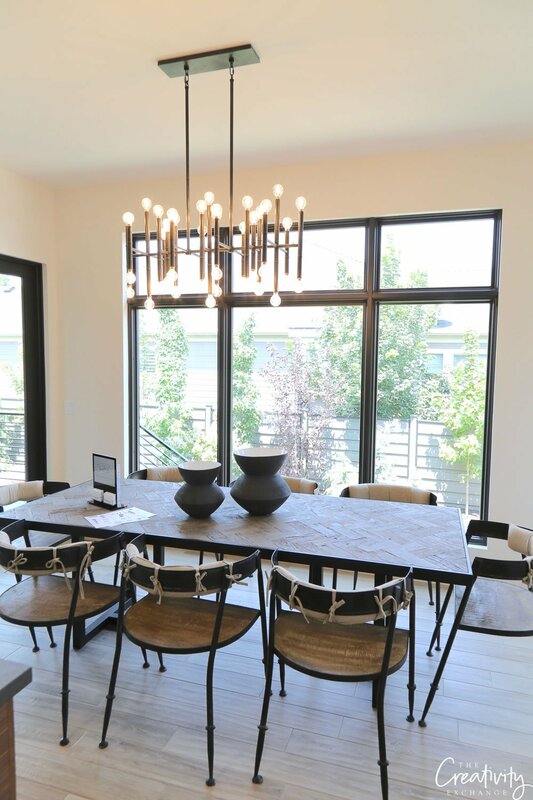 The dining room feels larger with its high ceilings, but it too opens up to the outside patio space. 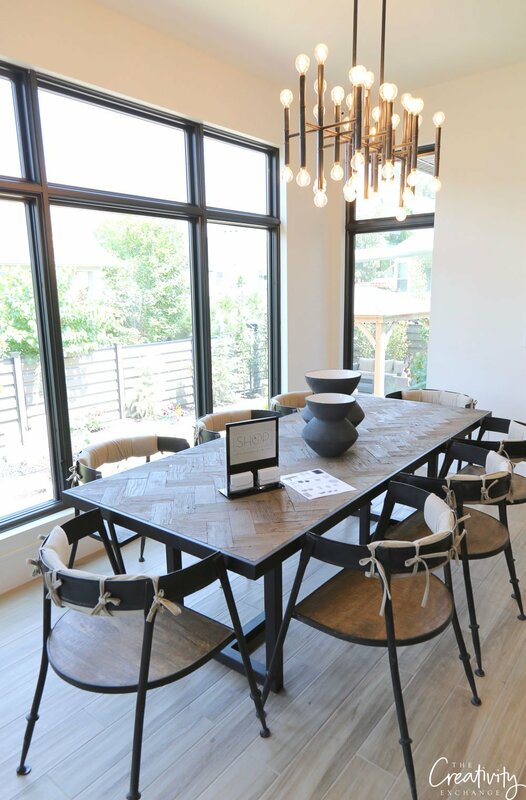 Modern lighting juxtaposed to a very country feeling table and chairs. It just works. 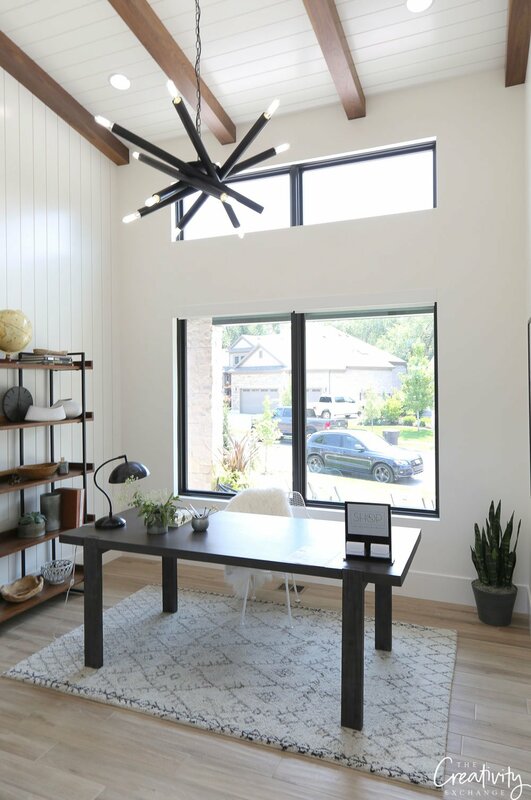 The extra high open beam ceilings add a bit of warmth to a very modern interior. 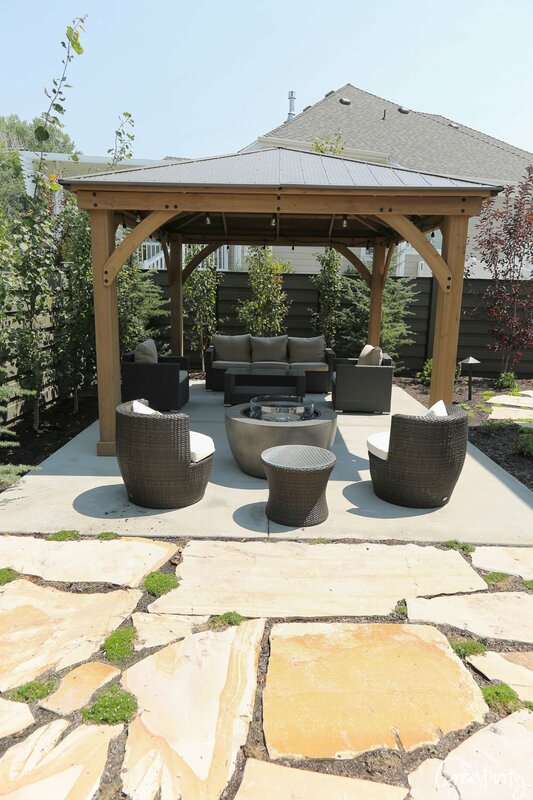 The doors slide open to create and indoor outdoor space. All the finishes in the home are perfect. 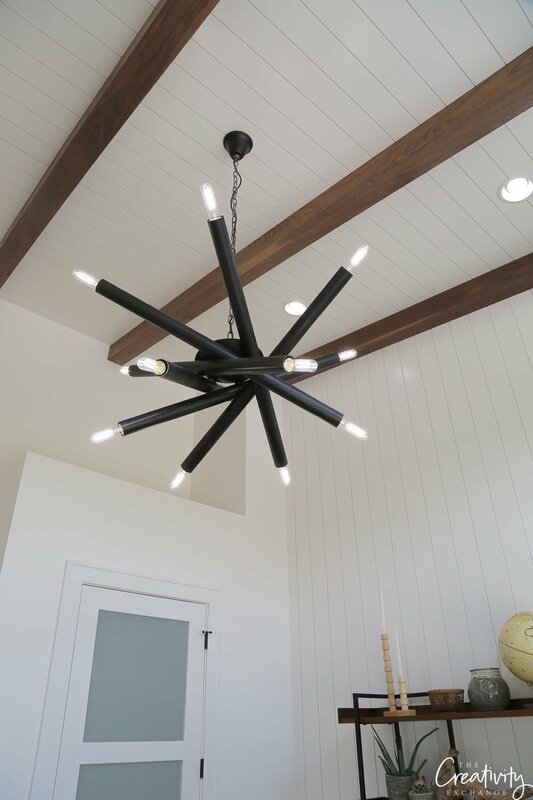 The modern light fixture is a great contrast to the traditional look of the open beams. 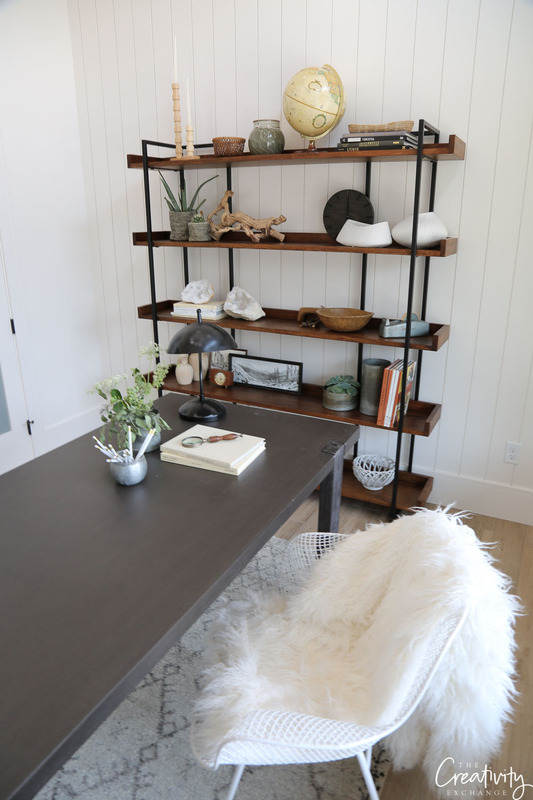 I like how the shiplap on the ceiling is continued on the far wall, vertically. 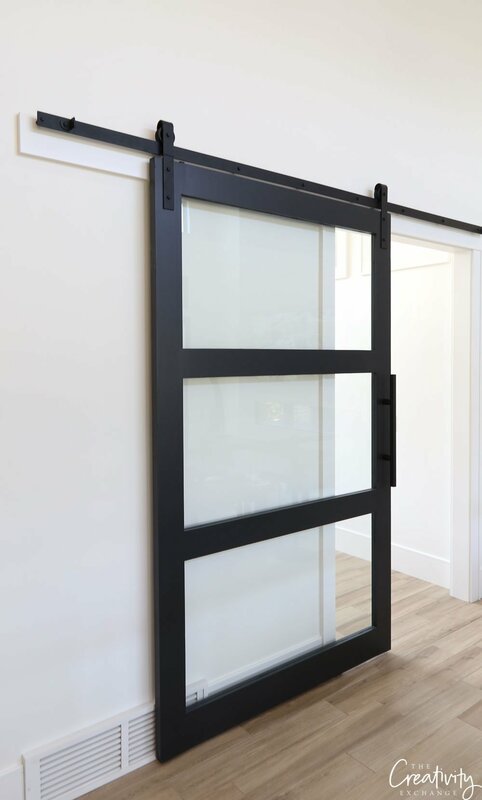 The office door is a modern glass barn door. Love the look. The glass keeps the airy feeling for the space. 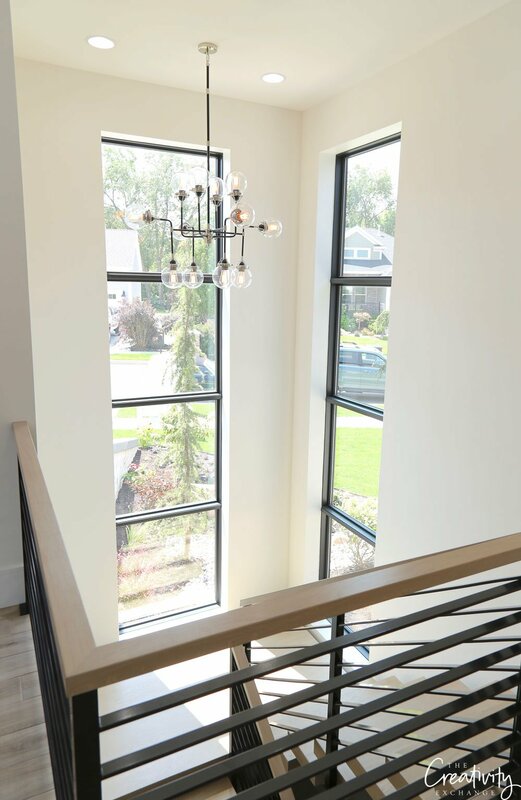 The theme is carried throughout with the three panel glass front and hallway doors. 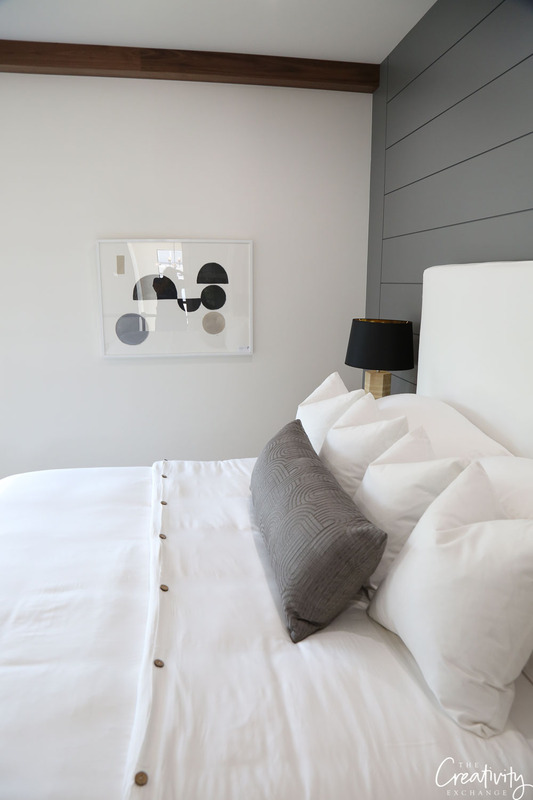 The master bedroom also has the exposed wood beams and again, like in the office, shiplap. An interesting choice mixing a bit of the old style and country in a very modern home. It’s not your grandfather’s aluminum siding. 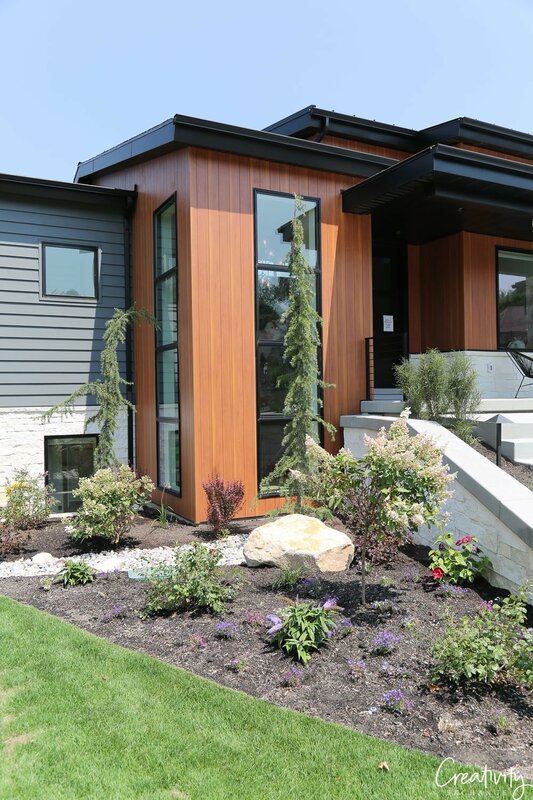 The only house in Utah with extruded aluminum siding. Yes, that’s aluminum, not wood! It’s virtually indestructible and you don’t need to paint or stain, just wash with water, it keeps insects out and doesn’t have any harmful emissions. 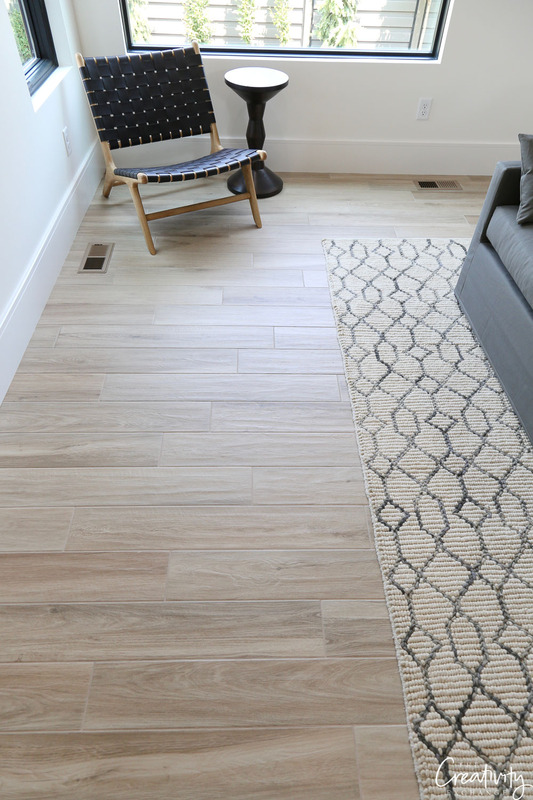 Let’s talk porcelain floors. This home had over 100 different tiles so there was no repeat of pattern. In person, it looked like real wood, but better. 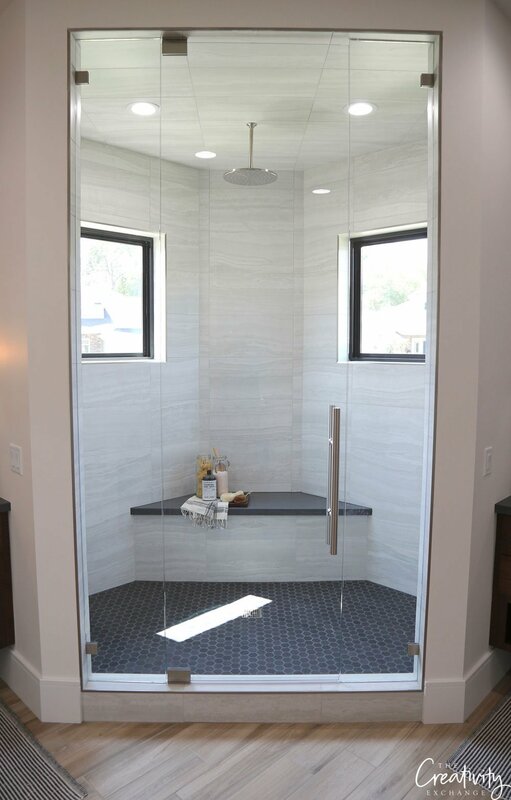 As the most durable type of tile on the market, porcelain is harder and less porous (impervious to water damage) than ceramic. Difficult to to scratch and simple to clean it is a great choice for heavy traffic households plus it cleans up a dream with just a vinegar-and-water solution. Granted, it’s more spendy than other tile and if it needs to be cut to fit, you need a wet saw with a diamond blade, but it’s worth it. Not everyone is a bath person. 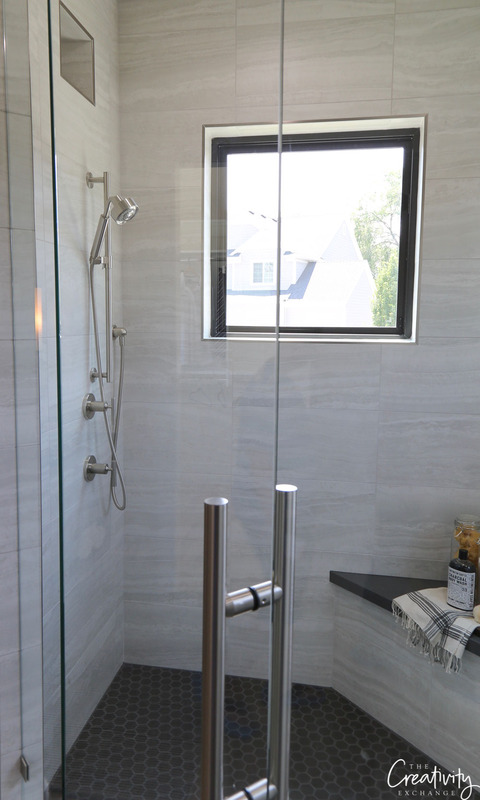 Take a page of this homeowner’s book and splurge on a shower. (The windows will of course be frosted). 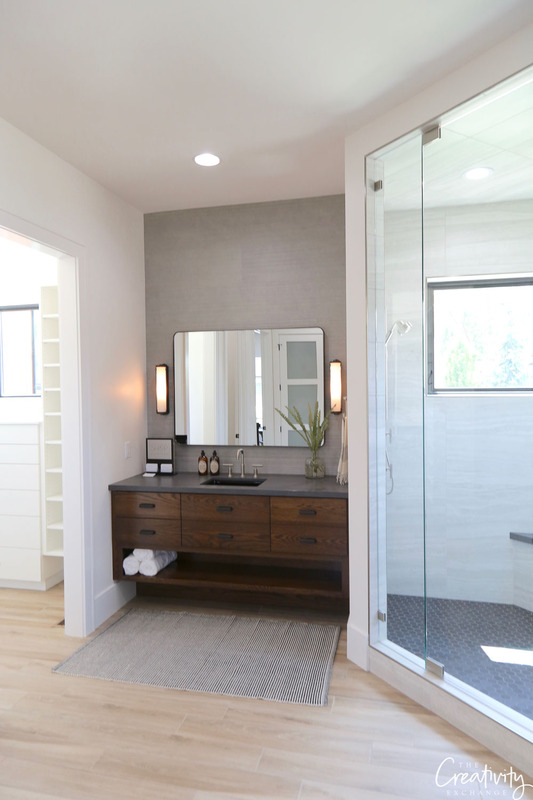 The rest of the bathroom is just as striking. The counters are quartz, just as they are in the kitchen. This is just one side of the walk-in closet. The staircase only connects to the house at that one point. 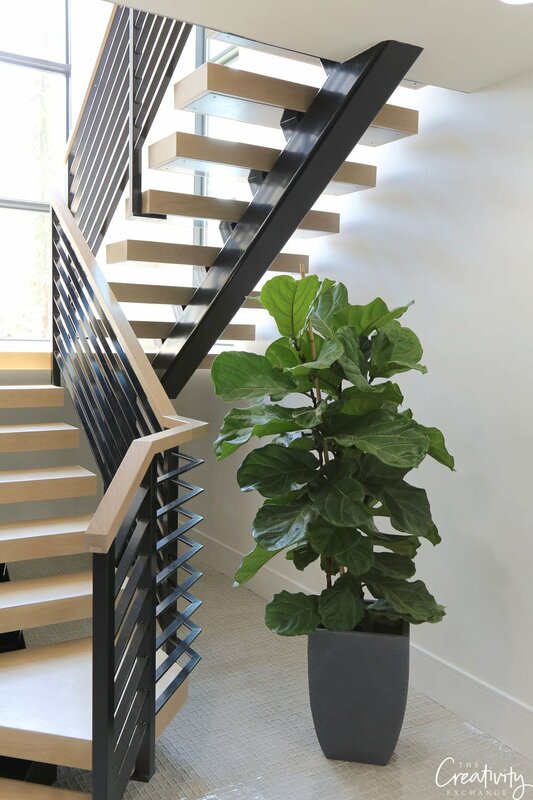 This staircase is a star in its own right. 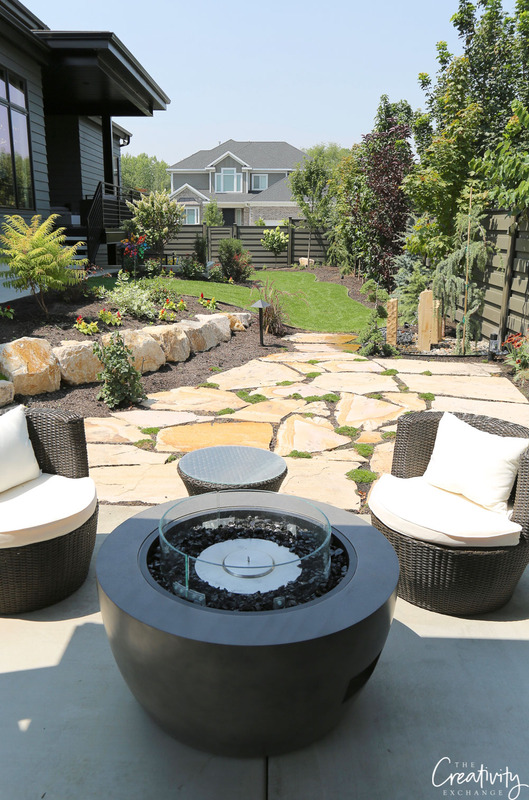 By unifying the landscaping in the front and back makes the most of the available corner lot space. In a few years the fence will not be visible behind all the trees. Knowing what is out there, even if it isn’t exactly what you are looking for, can send you down another path you never thought to look. I hope you’ve found new paths and inspiration. Homes are such a reflection of our lives, it is fun to peak into someone else’s dream home. 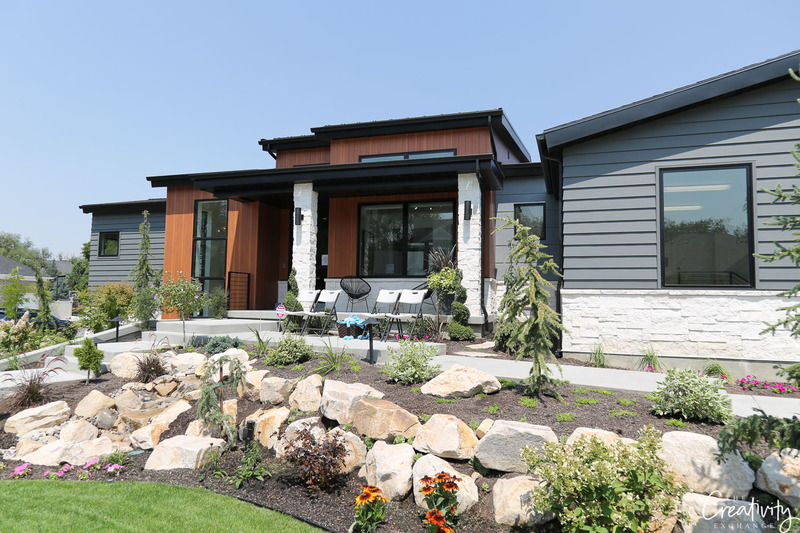 If you want to see more video home tours, we shared a really interesting walk-thru of a stunning energy efficient smart home a couple weeks ago here. 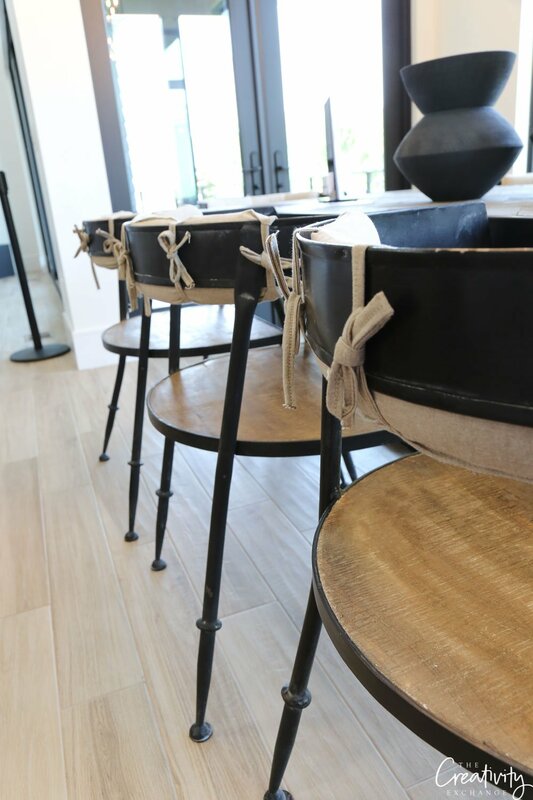 Wondering if you know the source for those dining chairs? Love them and don’t seem familiar. Any info on the white walls or the floor manufacturer? Cindy — Love this house ! So even though our outside is different could see the colors simular to what we r doing . Loved everything about this contemporary home!! Happen to know the great room area paint color? I’ll have to send you some pictures when we finish !! Thanks for all the inspiration !! I love the backsplash! I’m starting a kitchen remodel and would love to know the name of the collection. She mentions the manufacturer ad Daltile but any additional information would be appreciated! Thank you! Isn’t is gorgeous!! She said in the video that the Daltile backsplash will not be released until the end of the year. We see that sometimes where brands/products will provide the latest products in parade homes to showcase what’s coming. I would recommend contacting the builder Steven Dailey directly and ask them if they could provide you with a style number and maybe even their Daltile contact so you can reach out and get an exact date on the release. Good luck! Will you be doing more posts about your outside kitchen? I love it and am in the process of creating one. I’m a little stressed and I know that you mentioned doing a post on the appliances. I love your eye for details. Would you mind sharing the color of the accent wall in the bedroom? 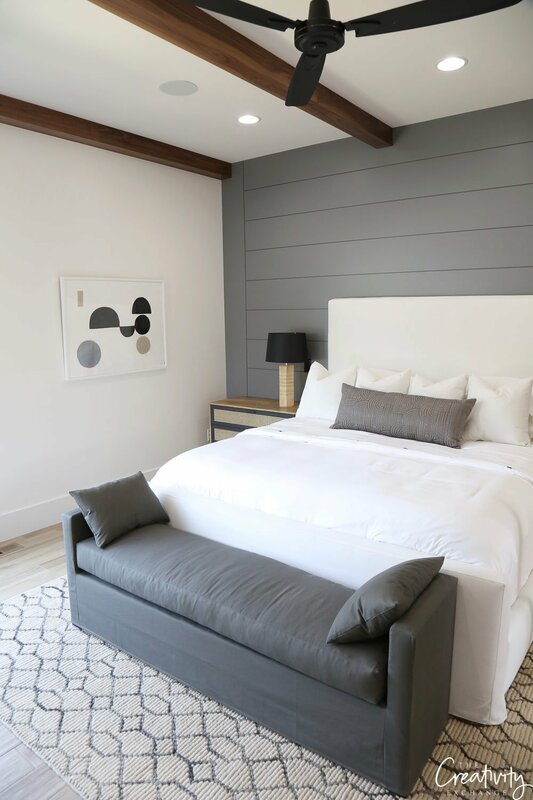 Cyndy, obsessed with the modern farmhouse style in the guest bedroom! Would it be possible to provide the paint color gray on the ship lap accent wall behind the bed? We are remodeling a bedroom and want to duplicate this look!